Making a sight word board game can be entertaining, educational and affordable. If funds are low, this is a great exercise to assist in developing your child’s sight word vocabulary! Creating the game board is easy – all you need is a poster board, pen and list of sight words. Using a poster board, create a path. The path can look like a snake or contain squares similar to Chutes and Ladders. Ideally each space should be approximately one-inch so you can write a sight word in it. Use pennies, dice or a spinner from another game to advance on the game board and cheerios (just don’t let your child eat them before the end of the game) or match box cars work perfect as game pawns. If your child does not possess a sight word vocabulary, consider limiting the board’s sight words to the following 10. Each child progresses differently. The number of sight words a child can learn will vary – some children can master 10 words in a week and others will learn only a few. After your child can automatically recognize a sight word, introduce a new one but remember to review the old sight words (previously learned) daily. Click here to obtain a PDF file of the above sight word board game. 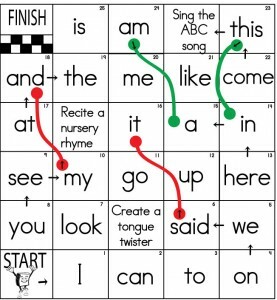 If your child can recognize some sight words, consider creating a game board using 25 sight words. Make sure you include the words he already knows as this provides a perfect confidence builder as well as a review. Here’s where your creativity can shine! 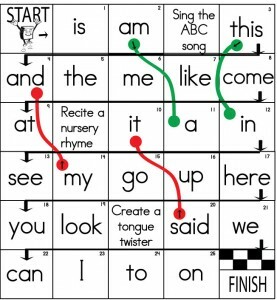 Similar to Chutes and Ladders, we created a matrix but filled it with 25 sight words and some fun obstacles – we can’t make it too easy to win. Click to obtain a PDF of the above game board sight word board game. You can also add alliterations (tongue twisters), ABC song and nursery rhymes to incorporate other fundamental reading skills. Similar to Chutes & Ladders you can add slides to advance (red lines) or move back (green lines) pawns. Prior to creating your sight word game, determine what skills and sight words your child needs to learn and create the appropriate game. Make sure to keep it fun! To reinforce print concepts, e.g. that we read left to right, top to bottom, create your game board to move along in a similar manner. Make sure you point this out to your child, e.g. we are starting in the top left hand corner just like when you read a book. Using your finger, point to how the pawn should move along in the game and make the connection to how we read a book. Consider opening a book to illustrate your point and locate sight words. 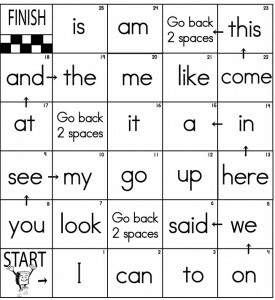 Click here to obtain a PDF of the above game board sight word board game. Players advance in the game by moving the number of spaces as determined by rolling a die. If you cannot locate some dice, use a penny (heads moves one space and tails moves 2 spaces). We prefer flipping coins to a die because you limit the number of spaces a child can advance and increase the number of sight words spoken. Prior to advancing, players must correctly identify the word in the space. Depending upon the player’s reading readiness, upon landing on the sight word the player can define the word and/or use it in a sentence. The first player to cross the finish line is the winner! Creating and playing sight word games can be an effective and entertaining way to teach children. Both of our children learned their sight words before most of their peers primarily by playing Erudition™. Both loved playing the game and are now fluent above grade level readers. Incredible tons of helpful data.. This is really interesting, great ideas on how to teach sight words with a fun game! Thanks for the great ideas on how to teach our children using a game. It’s fun and affordable – what more can a parent ask for! Thank you for the printables!! I played it with my son tonight and he loved it!! The bonus was that if he won, he got to eat both of our game pieces!! I won so now he wants to play it again tomorrow! !